Paul Tate Productions - Paul was Zebulun on the UK National Tour in 1990. This is his official site with information on Paul's production company and his career as an actor. Tread Productions - Grahm Tudor (Joseph and Issachar UK Tour 1998 - 2000, 2001 - 2002, 2005) and his wife run one of the UK's leading providers of Theatre, Representation, Entertainment, Acting Schools and Dramaworks. Tom Carradine - Tom has been a musician with Joseph on the UK tour of 2007, moving to Musical Director in the summer same year. He is a freelance musical director and keyboard player, check out his website for more information and to purchase his CDs. Ben Stock - Ben was Dan and alternate Joseph for the UK Tour 2000/2001. His website follows his career and you can also purchase his CD. Ellis Kerkhoven Official Site - Ellis played Dan, Levi and Joseph for the UK Tour 1999-2000. Follow his career on his website. Marlon Moore Official Site - Marlon played Gad/Pharaoh for the UK Tour 2004 - 2007, May 2009. His official site has info on his career, photos, contact info and much more. Louise Dearman Official Site - Louise was Narrator for the UK Tour 1998-1999. Her site has lots of info, photos and more. Tim Driesen's Official Website - Tim was Issachar and Joseph for the UK Tour 2000. His site is a great place to keep up to date on his career. Read Theatre School - Jamie Read played Benjamin for the UK Tour 2001 - 2001. He now runs this fabulous theatre school with his wife. They also run Read College too. More links will be added here soon. Do you have a website that is Joseph or theatre related? Or are you an agent wishing to advertise? Then email me with a link and I'll add it to the site. If you find any links below are not working please contact me. 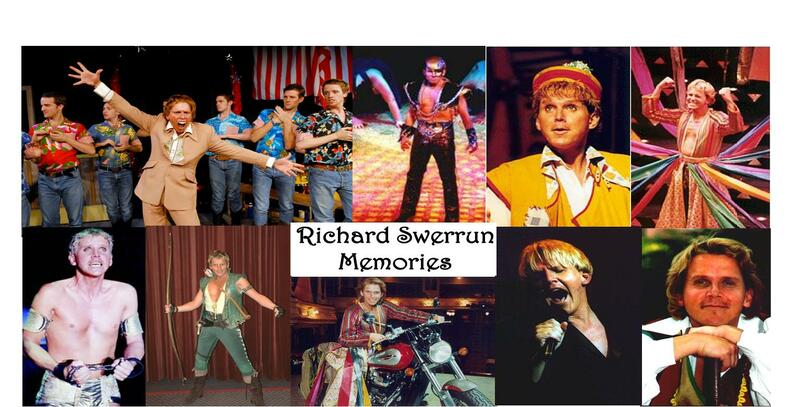 My Facebook group in memory of Richard Swerrun. Graham Tudor and his fantastic brothers and sisters are heading back out on the road taking this technicolor celebration of 50 years of Joseph and the Amazing Technicolor Dreamcoat and 20 years of their incredible brotherhood further afield.